Gifted pianist Tomáš Kačo, a successful scholarship recipient of the Bakala Foundation, gave his first performance following a three-year break at the Convent of Saint Agnes in Prague on 12 November 2018. The concert was a part of the “Resonance Movers” (“Hybatelé resonance”) series of piano recitals. For his spectacular performance, Tomáš received numerous standing ovations at the completely sold out concert. 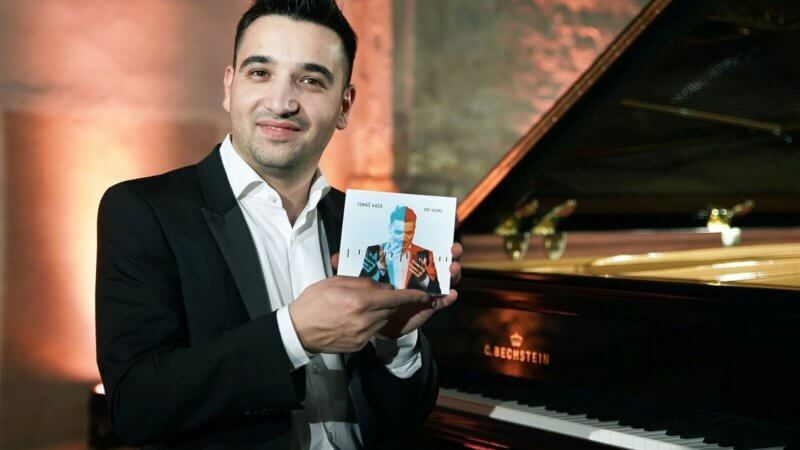 At the end of the concert, he unveiled his debut album, My Home, with help of his “godfather”, Ondřej Gregor Brzobohatý, and Brzobohatý’s wife, Taťána. His performance at the Convent of Saint Agnes mostly comprised of songs from this album. My Homewas supported by the Bakala Foundation. “Bakala Foundation scholarship recipients are students from different fields with various life plans”, says Michaela Bakala, chairwoman of the Bakala Foundation’s Board of Trustees. “What connects them, however, is their massive talent, dreams and courage to succeed in demanding studies abroad. I am so pleased that Tomáš, who delighted us with his temperament, is one such undisputed talent”. The concert concluded with an autograph-signing session and a toast for guests, including representatives of the Bakala Foundation. Supporting almost 150 Czech students at universities all over the world the Bakala Foundation also made it possible for this talented musician to attend and graduate from the prestigious Berklee College of Music in Boston. “The support for Tomáš from the Bakala Foundation is not only financial”, noted Václav Pecha, director of the Bakala Foundation. “We’ve spent thousands of minutes on Skype and have written millions of lines on Facebook, and we at the Bakala Foundation are really happy that we have been able to play a part over the past five fantastic years in this yet-to-be-written Hollywood story, and our wishes for him are that his hard work and name resonate all around the world”. Tomáš Kačo combines classical music, jazz and Roma music in his interpretations. In February this year he performed his own compositions and adaptations of works of Johann Sebastian Bach and Frédéric Chopin in famous Carnegie Hall. The concert at the convent of Saint Agnes was his first concert in the Czech Republic since graduating from Berklee College of Music in Boston.